As one of the longest running family-owned companies in Leicester, Norman & Underwood is recognised for skilled craftsmanship and excellence. Drivers Foods Leicester also has a long established presence in the region and when it came to choosing the right commercial glazing in Leicester, they naturally called us. The Driver family has a track record matching that of Norman & Underwood when it comes to serving the people of Leicester and the Midlands. Beginning with their grocery shop in Ibstock and later moving into the centre of Leicester, Drivers has become a well-known name in the area. The family recipes for pickles were produced and sold in their shops as early as 1902 leading to the formation of the Driver’s Pickle and Vinegar Company in 1906. Today, the fourth generation of the family still proudly continues the family tradition. You can find the Driver’s Pickled Onions, Malt Vinegar and other products in grocery shops and fishmongers around Leicester. The project that Driver’s turned to us for was a new entrance to their premises. Commercial glass supply and repair in Leicester is something we have extensive knowledge in and we knew we could find the right solution. While uPVC and other materials are very popular in domestic windows and doors, aluminium has become the best option for commercial premises over the years. After our window experts visited the premises and assessed the area for installation it was agreed that aluminium doors would be the perfect choice for this project. Versatile – aluminium can be made into many different forms and sizes. It can be used in large areas and the integral strength makes it long lasting. Security – when installed by a professional window company, aluminium windows are excellent for security. This makes them particularly appealing to commercial properties where high-value items and equipment are stored. Durable – the natural protective coating that aluminium generates gives it excellent weather resistance. This makes aluminium doors the perfect solution for business entrances and external windows. The frames can be painted or coated to a wide variety of colours to customise them to a business premises. A rise in popularity in aluminium doors for homes has also been seen with homeowners looking to have large sliding doors and glazing to bring the outdoors inside. 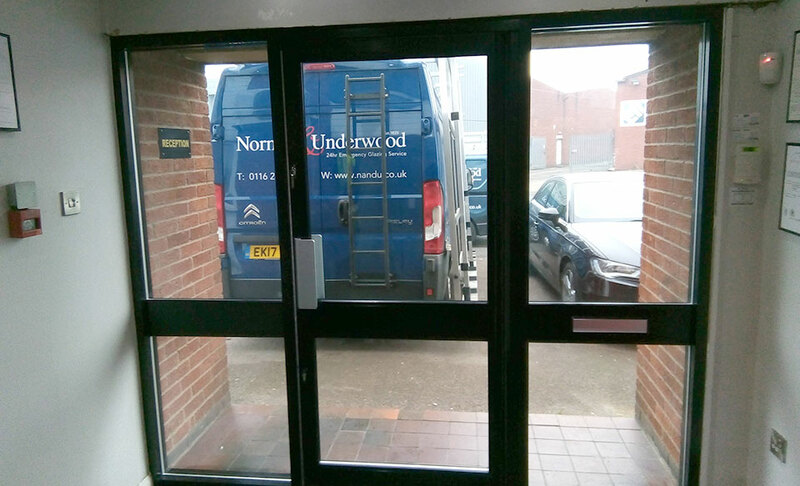 If you are looking for new shop from windows or you need commercial glass repair services in Leicester or the surrounding areas, Norman & Underwood can help. We can provide the right product for your premises with everything from frame-less glass screens to fire-rated safety glass and doors. Our team can visit your company and provide you with advice on the best commercial glazing options for your business. Click here to visit our other site.